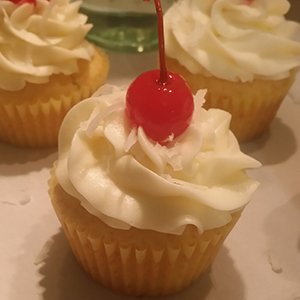 Pineapple-rum cakes with coconut cream filling and buttercream frosting. Makes 18-24, depending on how much batter you use for each one. Cream butter and sugars. Add eggs and rum extract, beat until smooth. Add flour, salt and baking powder, beat until combined. Add pineapple, beat until well combined. Spoon into lined cupcake pan. Bake at 350 20 min or until lightly browned or tests done. Cream butter and coconut cream in mixer. Add confectioners sugar, ¼ cup at a time, beating well after each addition. Add coconut. If too thick, add a bit more coconut cream or milk. If too thin, add a bit more confectioners sugar. To fill cupcakes, use a filling tip (like this one from Wilton) and a disposable icing bag. Fill them while they're still slightly warm (not hot!). MUCH easier than trying to cut out a piece from the center and spoon filling in. Like light years easier.